No one can say CW's four show crossover isn't an ambitious venture. 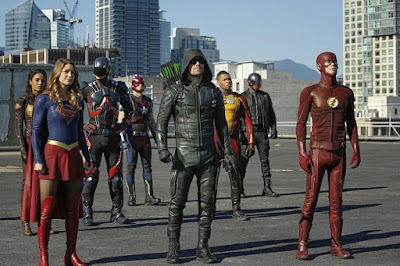 The newest trailer entitled "Heroes V Aliens: The Dominators" features extended scenes involving a worldwide alien invasion that bring the heroes of The Flash, Supergirl, Arrow, and The Legends of Tomorrow together. When aliens make a pre-emptive strike, The Flash assembles his super friends to take on the threat. The trailer includes more footage giving more context of what CW's version of the Justice League are up against. There's a cinematic quality to the action with plenty of humor and enthusiasm mixed in. The exchange between Supergirl and Heat Wave is especially charming. It's the type of lightheartedness that fans of these shows love. The epic four-way crossover begins on Monday with Supergirl at 8 p.m. on The CW. The Dominators are coming...can DC's heroes team up to stop them? The invasion begins Monday at 8/7c on The CW! A NIGHT OF CONFESSIONS; THE EPIC SUPERHERO CROSSOVER KICKS OFF TONIGHT -- Eliza (guest star Helen Slater) comes to town to celebrate Thanksgiving with her daughters. Alex (Chyler Leigh) decides it's time to come out to her mother; Kara (Melisa Benoist) is shocked when Eliza suggests Mon-El (Chris Wood) has feelings for her, and Winn (Jeremy Jordan) and James (Mehcad Brooks) consider telling Kara the truth about the Guardian. Meanwhile, CADMUS unleashes a virus that instantly kills any alien in the vicinity so Kara enlists an unexpected ally -- Lena Luthor (Katie McGrath). 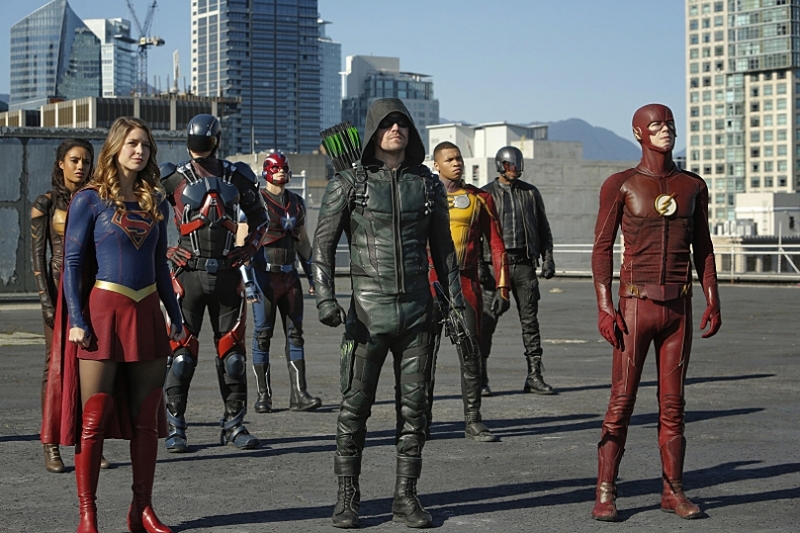 The epic superhero crossover kicks off tonight when Barry Allen (guest star Grant Gustin) and Cisco Ramon (guest star Carlos Valdes) seek Kara's help with an alien invasion on their Earth. Stefan Pleszczynski directed the episode written by Jessica Queller & Derek Simon (#208). Original airdate 11/28/2016.